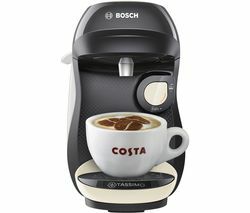 Tassimo coffee machines create delicious drinks at the touch of a button. Just choose from a range of coffee ‘pods’, pop your choice in the machine, and your perfect cup is poured in seconds. From flavourful ristrettos to indulgent cappuccinos, Tassimo makes great coffee deliciously simple. 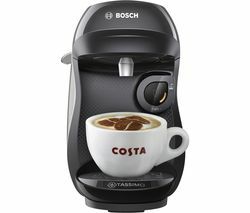 All Tassimo machines have been developed in partnership with Bosch, so they’re reliability and build are second to none. There are over 50 drinks to choose from, including coffees, teas and hot chocolates from brands like Costa, Twinings, Kenco, Cadbury and L’Or. Each drink is prepared individually at the touch of a button for delicious results. Tassimo coffee machine pods, called T Discs, are expertly designed to fit any Tassimo machine. Each T Disc has its own unique IntelliBrew bar code, which gives your machine all the information it needs to prepare your drink. It automatically ensures the right temperature, amount of water and brewing time for the perfect cup, every time. You can choose from a range of stylish Tassimo coffee machines to suit your home. The small, chic Vivy is the compact one. Big on taste, but small in stature, at just 17cm wide it’s been designed to fit into kitchens that are low on counter space. The Tassimo Caddy is the tidy one, with built-in storage capacity for your Tassimo T Discs. It features two holders, giving you space for up to 128 T Discs in total, to keep things neat in the kitchen. The Tassimo Suny is the speedy one, and starts preparing your drink as soon as you press your cup against the Smart Start button. Some models also come fitted with Brita Maxtra water filter technology to reduce chlorine and limescale. All of our Tassimo coffee machines are sleekly designed and compact and come in a range of colours. From smart monochrome and pastel finishes to bright Autumn red and Pacific blue, they provide an easy way to add a touch of colour to your kitchen. For more ways to enjoy delicious coffee every day, take a look at our full range, including the latest barista-style DeLonghi coffee machines and easy Nespresso coffee machines.